I think, but I am not very sure, there used to be 2 cinemas in Toa Payoh Central. (Hope readers can confirm). One was Kong Chian Theatre located at the junction of Toa Payoh Central and Lorong 4; next to the Library. The other was called Toa Payoh Theatre near the present HDB Hub. It was owned by the Eng Wah Group. I don’t remember seeing any movies at Toa Payoh. As for Kong Chian, I remember two movies. The first movie was The Ten Commandments. This was probably in the 1980s and I accompanied my mother to watch it. The Ten Commandments, starring Charlton Heston and Yul Brynner was a very old movie, that I had watched before as a kid. My mother wanted to watch it again. She wanted to enjoy the cool special effects, such as the classic scenes of the parting of the Red Sea and inscription of the 10 commandments onto the two stone tablets by fire. It was a very long show. The second show that I watched there was Gorillas in the Mist. This was in 1988. I went with my wife and a strange thing happened. Mid-way through the movie she wanted to go home. Do you know why? She was troubled by this scene where the poachers snatched a baby gorilla from its mother. The baby gorilla looked so cute and so pitiful. The scene made her think of our year-old daughter who was home with the maid. Of course we did not (go home), but after that scene she could not concentrate on the movie anymore. Besides the movie theatres, I remember Toa Payoh Central mainly for the coffee houses which I had blogged about here. There was a hawker centre next to the bus interchange (see photo below; courtesy of National Archives of Singapore) but I did not like to go there. It was crowded, noisy and dirty. Subsequently, after the construction of the Toa Payoh MRT station, they built an air-conditioned food court near the station. I too did not like to eat there for the same reasons. Today that part of Toa Payoh Central has changed drastically. What hasn’t changed is the noise the and the crowd. The date was 2nd of March, 1984. It was my second last day at Philips and my colleagues treated me to a farewell lunch at a Chinese restaurant called Lucky Restaurant. It was situated just beside the Kong Chian Theatre in Toa Payoh Central. I believe the building is still there. I remember one of my cheeky female colleagues by the name of Mon Yeh, gave me an unusual farewell present. I cannot remember the name for this item. It is small napkin that you hang around a baby’s neck to prevent him for messing up his clothes when he is eating. No need to explain why she chose such a present. They tried to make me put it on, but it was too small. Unlike many of my friends, I did not like to job-hop. Throughout my career, I have had only 2 big employers, Philips and NPB. 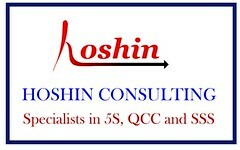 The rest of my time, I was running my own business; initially with a partner, and subsequently, until today, on my own. Hence you can see that that farewell lunch at Toa Payoh Lucky Restaurant was a memorable milestone in my life. This morning, I woke up to the sweet sound of distant thunder. After a day of sweltering heat and a night of suffocating humidity, this sound was (pardon the cliché), music to my ears. It reminded me of a piece of Chinese classical music that I used to enjoy. The title was; 旱天雷, or Thunder in Dry Season. This piece was in my first Chinese Classical LP record by (I think) the Singapore Chinese Orchestra which I bought in 1969. 旱天雷, as you can probably guess from the title, depicts the excitement and elation which farmers felt when they heard the distant rumblings of thunder during a time of drought. I believe this piece originated in Guangzhou in Southern China; and we used to know it by its Cantonese name, “Hon Tin Loi”. Here’s a version performed by the China Broadcasting Traditional Orchestra (中国广播民族乐团). Please listen to the end to see the sudden switch in mood brought on, no doubt, by the thunder. Interestingly, this tune was also used to accompany the programmes by the famous Redifussion story-teller, Lee Dai Sor. I remember there was a very funny Cantonese song version titled; “Ping kor wah ngor sor” – "Who says I am stupid?" Maybe that was how Lee Dai Sor got his nickname of Big Fool Lee. I worked for five-and-a-half years in Philips Audio Factory from 1978 to 1984. 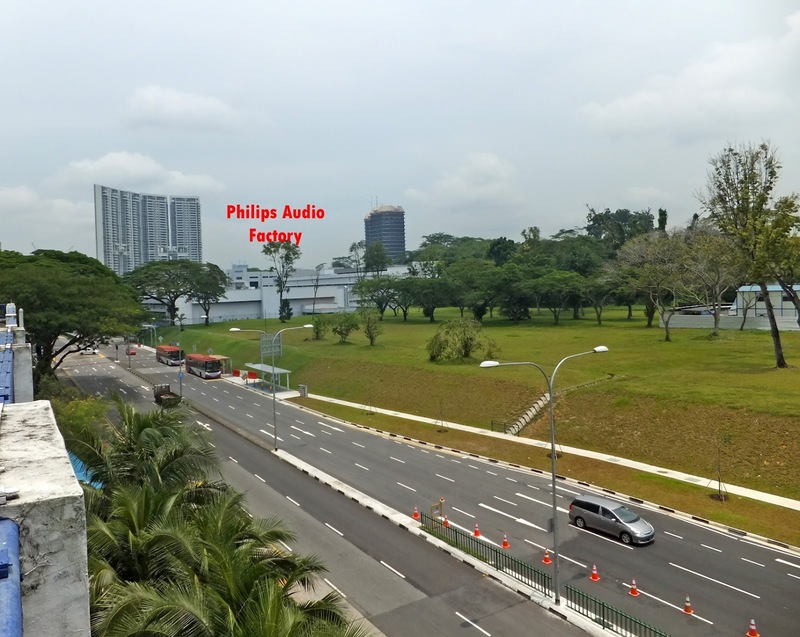 Initially there were only 2 Philips factories in Lorong 1 Toa Payoh - Video and Audio. These 2 factories were separated by a short road called Toa Payoh West. At that time, it was a no-through road. A pedestrian bridge joined our two factories. At one stage my office was facing Toa Payoh West; and every evening at 5.45 pm, when the end-of-day siren went off, I was treated to an amazing sight. As the female production operators from both factories poured out into Toa Payoh West, the whole area became a sea of blue; blue being the colour of the Philips uniform. Coupled with the waiting buses and cars, the area was quite chaotic. I doubt Philips employees today can ever see such a sight again because for a number of years now, Philips has ceased its manufacturing operations in Singapore. But what is even more amazing was the speed with which the crowded dissipated. By 6 pm, the whole area was all quiet and disserted. Subsequently a third factory was added just behind ours. It had a very long name which I cannot recall. I think it was called VOSC – Video Overseas Supply Centre. We simply referred to it as Video 2. I remember that from the windows at the rear section of this factory, one can actually see the mortuary of the nearby Toa Payoh Hospital. I believe today there are a total of 4 buildings in the huge Philips complex at Toa Payoh. When I started work at Philips, I used to take the SBS No. 153 (I think) from my home in Farrer Road. This bus took a very long roundabout route. 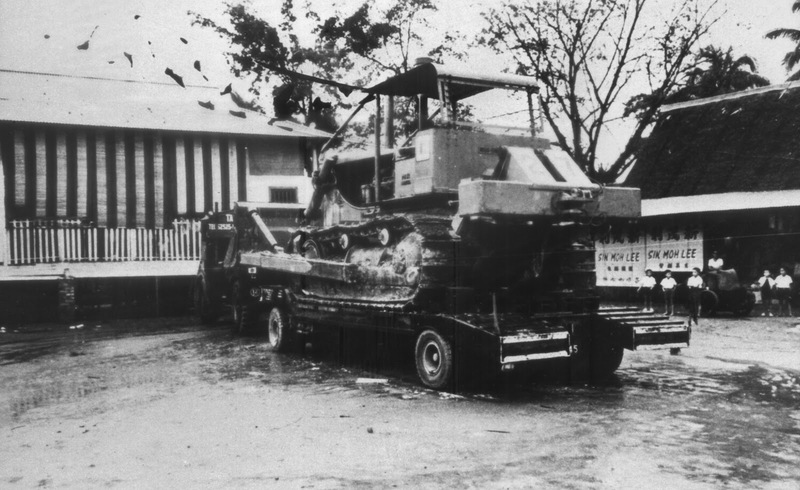 It went through the following roads, Dunearn, Whitley, Thomson, Braddell, Toa Payoh Lorong 6 and then Lorong 1. I would get off at the bus stop near Toa Payoh Rise. When I first used the bus stop in Lorong 1 near Toa Payoh Rise, I noticed something quite unusual. I noticed that the pedestrian crossing lights made a loud beeping sound. Later I discovered that there was a school for the blind nearby, and the loud beeping sound was for the benefit of the blind pedestrians. I saw them cross the road occasionally and was very impressed by the confident manner that they navigated along the public roads. One day, I noticed some Philips employees disembark at a bus stop along Thomson Road, near to the Polo Club. I found out later that they took a shortcut by walking through the Thomson Secondary School. Occasionally I too took this so-called shortcut. I remember walking through their tuck shop. But this wasn’t a very attractive alternative. The distance we had to walk was quite far and by the time we reached our office, we would be all sweaty and sticky. And we didn’t save much time. Today, the Thomson Secondary School is no longer there, but in its place I saw a sign saying SJI International. Don’t know what to get for your parent’s birthday? Instead of adding to his calories with chocolates or an expensive meal, why not take him on a stroll down memory lane? Get him a copy Good Morning Yesterday. Available at Times, Kinokuniya and Popular at only $18.65. PS – If you cannot find my book at the book stores, please let me know so that I can feedback to the distributor. Send me an email, and I will do something about it. Anybody who wants GMY should be able to get one! The year was around 1970 and Toa Payoh new town was already completed. At that time I was still staying in a kampong off Lorong Chuan not far from Toa Payoh. We often had friends who visited and stayed overnight. As our financial position had improved, we could afford a family car and treat ourselves to supper occasionally. I remember we often went to the hawker centre located between Toa Payoh Lorong 6 and Lorong 7. We liked to patronize the fried Hokkien prawn noodles there. There were 2 stalls side by side selling the same product. Both were good and gave value for money. We often ta-pau (take away) the delicious noodles back to our kampong to enjoy with our friends. Today this hawker centre has been upgraded and carries the fanciful name Kim Keat Palm. Occasionally, I still go there for lunch. In 1978, I join Philips Singapore (Audio Factory) as an Industrial Engineer. Our factory was located at Toa Payoh Lorong 1. During my five-and-a-half years, there, my colleagues and I used to go all over Toa Payoh in search of nice makan places for our lunch. One stall we often patronized was a chicken feet noodle stall operating in a coffee shop at a Block 165, which was just next to our factory. This block was on higher ground compared to our factory. As we emerged from the side gate at Lorong 1, we would turn left, climbed a flight of steps, and there was our coffee shop. My colleagues and I referred to this place as “Hilltop”. Because of its convenient location, the place was often very crowded with Philips employees during lunch time. Hence, we did not patronize this place as often as we liked to. We did not want to compete with the production operators. Unlike them, we executives had more flexible lunch hours. I do not know how to describe the chicken feet noodle except to say that it was very different from those that you see nowadays at stalls that sell wanton mee. For one, they served the noodle in a bowl and not a plate, as is the practice today. The chicken feet were cooked to just the right degree so that the skin does not drop off easily. I think they fried it beforehand so that the skin was crispy and yet tender. The gravy was very spicy hot; but I loved it. Prior to working in Philips, I never enjoyed chicken feet. Unfortunately, after I left Philips in 1984, I never was able to find another chicken feet noodle that could match the one at Toa Payoh Lorong 1. I returned to Toa Payoh Lorong 1 recently to check out this place. As expected, there has been much change. I was sad to see that our beloved “Hilltop” makan place has disappeared. In fact the entire area has been cleared and all I saw was an empty field (see photo). Once again, I felt that familiar pang of losing a part of my past. Another eating place in Toa Payoh that my colleagues and I used patronize was a Hainanese beef noodle stall at the hawker centre located between Toa Payoh Lorong 6 and Lorong 7. Operated by an old Hainanese couple, the beef noodles was wonderful. As one of my colleagues, Mr K C Lee, could speak fluent Hainanese, the couple was very friendly with us. One day, whilst we were having lunch at this hawker centre, we witnessed some commotion. Not far from us, in one of the HDB blocks of Lorong 7, we saw a large group of people, including several policemen. This was shortly after the famous Adrian Lim murder case which shook Singapore. Apparently he had been brought back to the scene of his crimes for questioning and investigation. So the year must be 1981. Dragon Gate Inn in Singapore? In 1967, there was a very famous wuxia movie directed by King Hu (胡金铨), called 龙门客栈 (Dragon Gate Inn). Did you know that we also had a Dragon Gate Inn right here in Singapore; in Toa Payoh in fact? 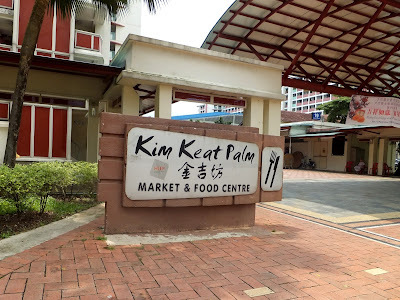 It was the name of a kopitiam in near the entrance to the hawker centre and market at Toa Payoh Lorong 6. The shop owner must have been a big fan of the movie. I personally did not enjoy the movie; and could not understand why it was such a big hit. But anyway, I found the name of this shop rather amusing. The coffee shop is still there today; but apparently the present owner is not a big fan of the Dragon Gate Inn, and I did not see the banner with this eye-catching name any more when I visited the place recently. Another place that my colleagues and I often had our lunch was this coffee shop in Block 124 which was across the road from Toa Payoh Rise. Today this area has been upgraded with a new multi-storey car park and a fanciful name called, Toa Payoh View II. One day, when we were having lunch here, I witnessed something very disgusting. There were a group of Ah Peks, and one of them was eating live, newborn mice. He swallowed the mice with some liquor and dried longans. They claimed that this had good health benefits. Out of curiosity, we joined the group to watch the action. I can never forget the sight of the baby mice. They were pinkish-grey in colour. I wonder if Singaporeans still indulge in the disgusting practice? Here’s an extract from my book Good MorningYesterday which I want to dedicate especially to teenage boys of 21st century Singapore. I remember Golden Coach was operated by two brothers. They were about the same age as my older brothers. 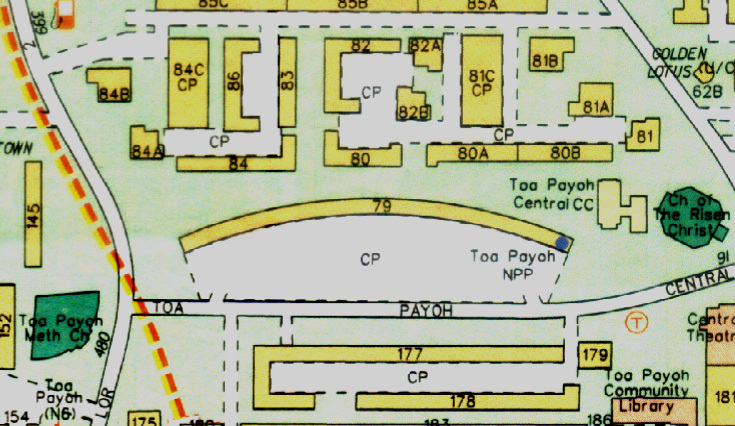 Subsequently, when Toa Payoh New Town was completed, they shifted to Toa Payoh Central occupying a shop along Block 177 which faced Toa Payoh Central (road). Across the road, facing the shop was a very interesting block of flats. This was Block 79. It’s long, curved shape reminded me of a Claymore mine. I don’t think I have ever come across such a long block of HDB flat; have you? For a number of years, my brothers and I continued to patronize Golden Coach; possibly until we moved out of our kampong in 1974 to Farrer Road. Today Golden Coach is no longer in Toa Payoh Central. I did a search on the internet and found a Golden Coach Tailor at Ang Moh Kio Ave 1, Block 332 #01-1897. I wonder if they are the same? Should pay them a visit and perhaps renew old friendships. I studied at the Anglo-Chinese School from 1964 to 1968. Every afternoon, I would take Tay Koh Yat bus no. 9a from Newton Circus to my home at Lorong Chuan. 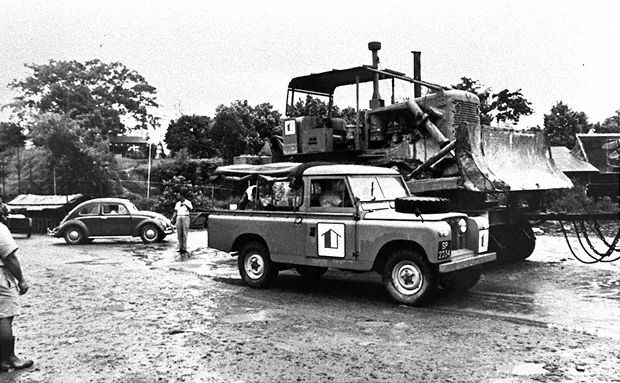 During this period I saw them construct two of Singapore’s earliest flyovers. 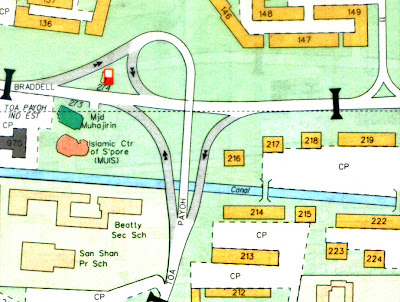 The first one was called the Thomson Flyover where today’s PIE (Pan Island Expressway) crosses Thomson Road. Under this flyover, there used to be some very famous hawker stalls. But I seem to recall that we usually referred to this place as the Whitley Flyover; and not Thomson Flyover. Anyway, its main function was to provide access to the new HDB estate called Toa Payoh. I believe this was Singapore’s second flyover. Do you know which was the first? I think, Singapore’s first flyover was the Clemenceau Flyover. Anyway, I am basing all these on memory. You will have to ASK the good folks at the NLB if you want to verify my information. I remember that there was a very serious and fatal accident during the construction of this flyover. The completion of this flyover was big news in the papers. It was a simple affair compared to today’s enlarged version; with perhaps only 2 or 3 lanes in each direction. Subsequently, when I started work in Philips in Lorong 1 Toa Payoh, I used this flyover almost daily commuting to work from my home in Farrer Road. Over the years, this flyover has been expanded several times, as far as I can recall. 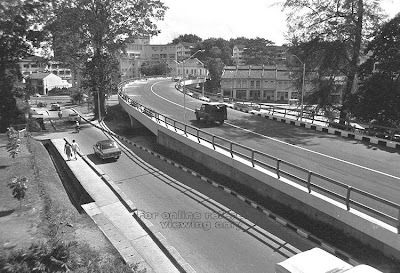 This photo shows the Thomson Flyover in the direction of Toa Payoh in 1971. 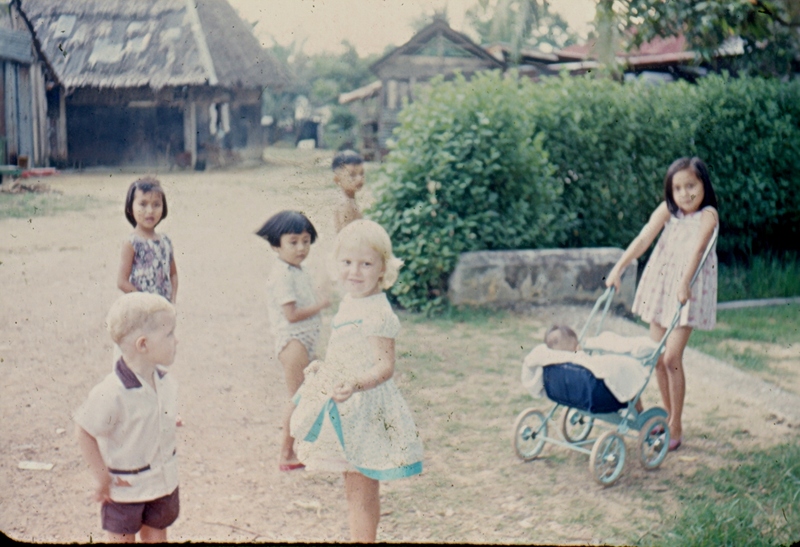 Photo from the National Archives Picas collection. 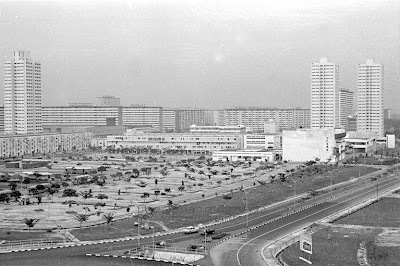 This photo shows the Clemenceau Flyover in 1970. Photo from the National Archives Picas collection. This was the Toa Payoh North Flyover at Braddell Road. I remember three interesting things about this flyover. 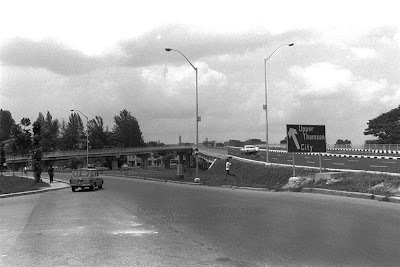 One; there was a Caltex petrol station right next to the flyover. As you turned into Toa Payoh, coming from the direction of Thomson Road, you will go around this Caltex station on your right hand side. Likewise, when you exit from Toa Payoh Lorong 6 to go towards the Serangoon Road direction, this same petrol station would also be on your right as you turned into Braddell Road. Today, this Caltex station is no longer there. Two. Next to this flyover, on the Bishan side, there was a hill. One day, when my father brought us to the Kampong San Teng cemeteries for the annual Qing Ming grave sweeping exercise, I took a rest along one of the pavilions on a hill top. I chanced to look downhill and guess what I saw? This Toa Payoh North Flyover and Braddell Road! The year must be around the early 1970’s. My third memory of this flyover was in 1977 when I was doing my national service. I was attending the Junior Officers Engineer Course at Gillman Camp. One of the lessons we had to learn was how to set up explosives to demolish roads and structures. And so a group of us went to this flyover with our measuring tapes to take measurements of the key dimensions of this flyover. After that we returned to our classroom to do our calculations and plan the circuit for demolishing this flyover. Unlike the Thomson Flyover, the Braddell Flyover has not changed much over the decades. What has changed drastically is the surrounding; especially Bishan and the stretch of Braddell Road leading to this flyover. But I just read in the newspaper last week that they are going to expand this flyover to alleviate the traffic congestion between this point and the CTE. Earlier this month, I posted a series of articles to the Singapore Memories Portal in support of their Iremember goes to Toa Payoh project. I reorganize and reproduce them here for GMY readers. 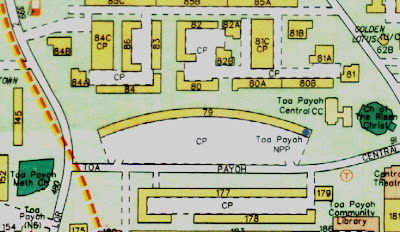 The first time I saw Toa Payoh, I didn’t know it was Toa Payoh. The year must be around 1963 or 1964 and I was studying at the Braddell Rise School. This was a primary school that was located next to the Mount Alvernia Hospital. The main entrance to our school was from Thomson Road, and at the back of our school, i.e. at the top of the hill was our school field. At the edge of the field was a fence with many shrubs at the other side. It was at this field that we had our sports events and played the boys’ favourite game, Hantam Bola! The location of this field, in today’s terms, would probably be the Assisi Home and Hospice. One day, for reasons I cannot remember, I stood on my toes and peered over the school fence and the shrubs outside. I saw something I had never seen before all my days living in a kampong. I saw in the distance, a huge piece of land that had been cleared of its vegetation; i.e. totally bare surface. I did not know it at that time. 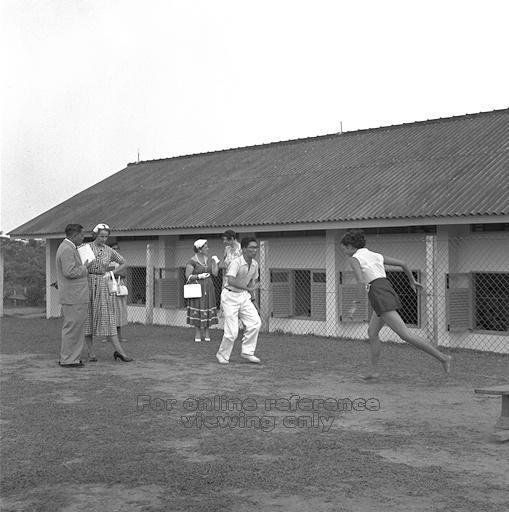 They were constructing one of Singapore’s earliest modern HDB housing estates – Toa Payoh. 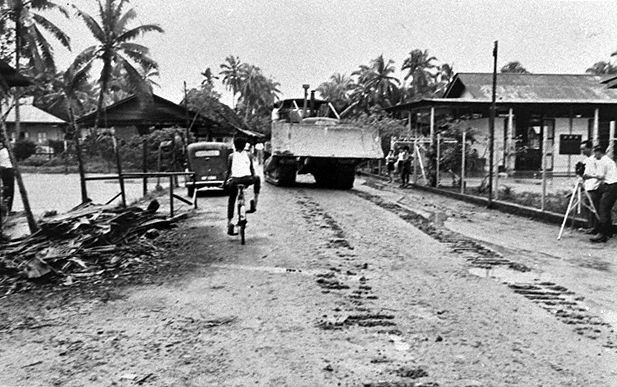 This 1963 photo, from the National Archives collection shows a wayang stage along Braddell Road. 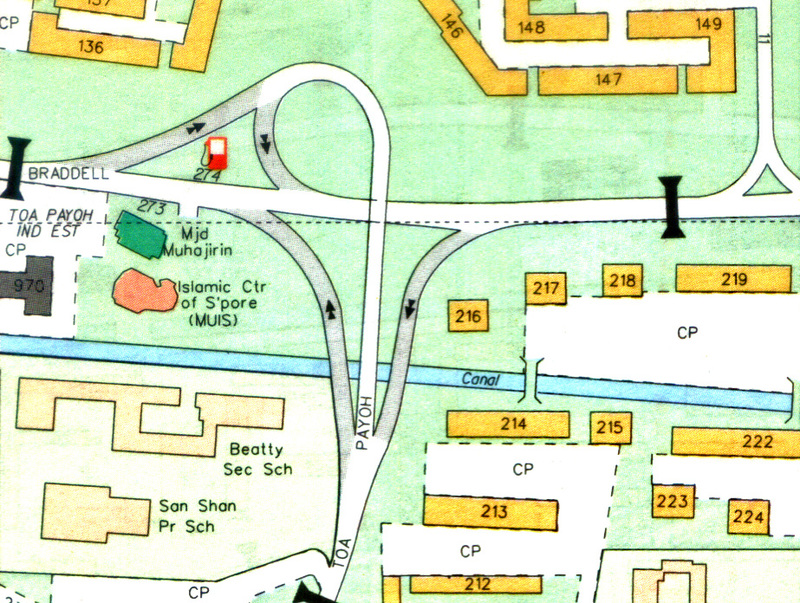 The exact location in today’s geography would be somewhere near Toa Payoh blocks 217 or 218; i.e. between the Kallang River and Toa Payoh North Flyover. During my primary school days in the 1960s, I passed by this wayang stage practically every day. There was something very interesting about it. During the Chinese Seventh Month period, also known as Hungry Ghost festival period, this wayang stage would come alive with opera shows. But on normal days, it functioned as a school. Hence, when my bus passed by, I could see students attending classes on the wayang stage! In this photo you will notice a huge bull dozer and some children standing around a shop with attap roof, and gawking at the action. Do you know where this bull dozer is headed? It is headed towards what would become Singapore’s largest and most modern HDB estate, Toa Payoh. Joining an army of similar earth-moving equipment, it will convert kampong and farmland into a modern housing estate which will provide high-rise apartments to house the former kampong folks. 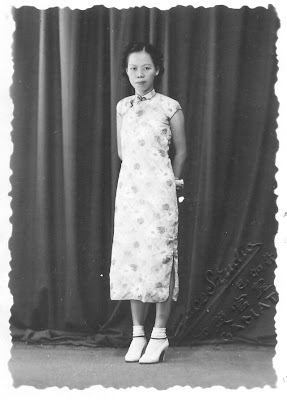 I understand that the folks at the museums are organising an exhibition on the cheongsam called, “Are you in the mood for cheongsams”. 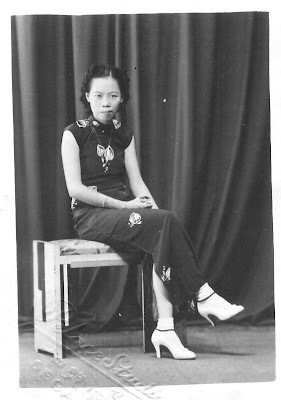 Whilst I am in no position to comment, I do have in my possession some old photos of my late mother in cheongsam. These photos are probably from the 1940’s; before I was born, and hence I don’t recognize most of the other people in the photos. I think it was fashionable for young ladies of that era to take go to the photo studios to have such photos taken. I have posted these photos to my Good Morning Yesterday (book) Fan Page here. Enjoy. Sorry for the poor quality of the photo. I do not have the photoshop skills to fix the 'defects'. My mother is seated. 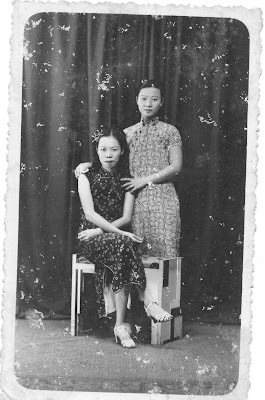 My mother is on the right. I wonder who is the kid she is holding. Too small to be my brother Chun Chew. The 3 young men are her younger brothers. I think the writing at the bottom right says, "21st June 1947"
Anyone got similar photos to share? This month, I received 2 emails from overseas readers. I have been reading your posts on 'Good Morning Yesterday'. I came across your site when researching Singapore. 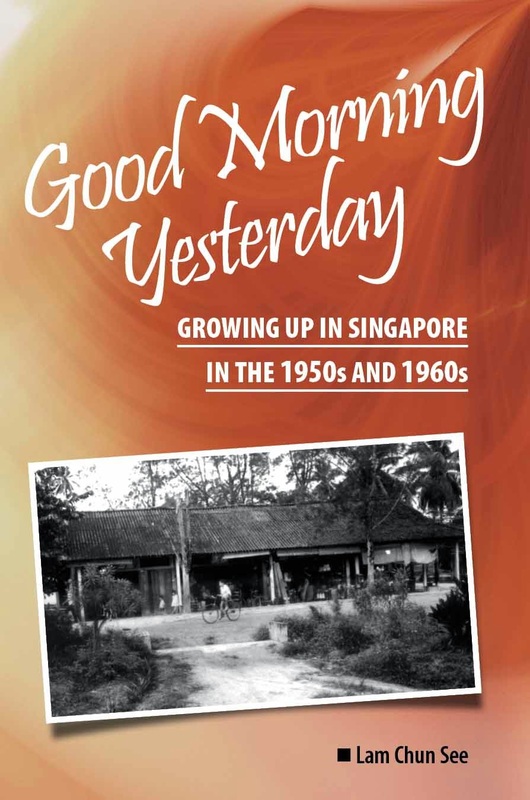 I lived there (Thomson Rise and Queens Avenue Sembawang) as a child from 1962 to 65 and have a number of photos and researched what and where they were of. It really seems like it has changed so much since I was there but it is so nice that you are sharing your memories. I have enclosed one photo, I think it is one of the occasions I went to the Kampong where I think I went with one of my amahs and played there? I have a video of me with other children playing in door way and really think that was there. I have many photos and if you are interested would be happy to share them. My name is Chris Wood. I was a service personnel part-time projectionist at the "ARC" cinema in Ayah Rajah Road and also at the "Sampan" cinema in Tanglin Barracks. The civilian projectionist went on strike once and I had to man the Sampan on my own for a period. The "Kent" was being built when I left Singapore in 1963. I also went on a chief projectionist course with AKC, when I returned to the UK I left the army and worked for the AKC full time as a service engineer from the head office at Chalfont St Giles, the London office was in Dover Street in the west end of London. 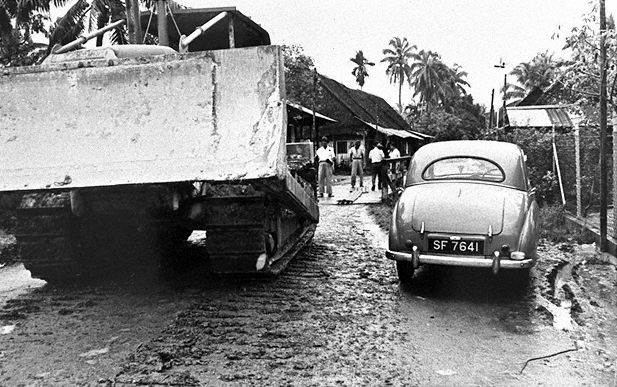 I have returned to Singapore a couple of times and the "Sampan" was demolished the foundations could be seen but that's all and the "Arc" was also demolished and under the Ayer Rajah Freeway. The "Arc" was a huge metal air raid shelter, all the music played was supplied by AKC and we could only play that. They were great days, the chief operator at the Sampan was an Indian, and at the Arc a Chinese guy. On Thursday night they use to show Hindustani films which were very well attended, these films would go on for hours, parts in B/W and parts in colour. The reason was that somebody would start making the film then run out of money and sell what he had made to somebody else who then made there bit in B/W. The film might change hands 3 or 4 times from producers!!! Footnote: Thanks to Chris Wood for confirming something I remembered from my childhood days. I had blogged here that some of the later black and white Wong Fei Hong movies that I had watched at the Bright Theatre near Lorong Tai Seng had the last segments in colour. My brothers said they do not remember any such thing. I dedicate this article in memory of my good friend and mentor, Derek Lehrle who passed away in 2009. 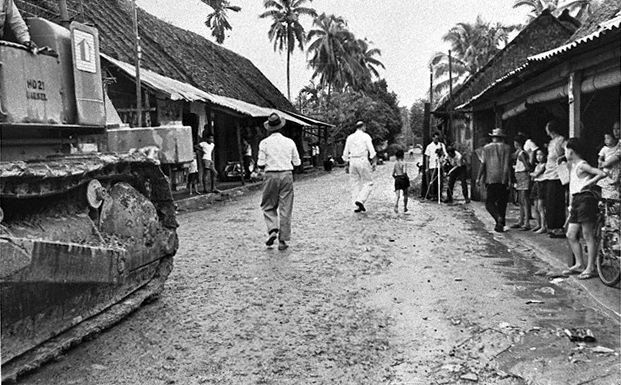 Derek was a great guy willing to impart his knowledge and photos of what he saw of Singapore in the 1950s. 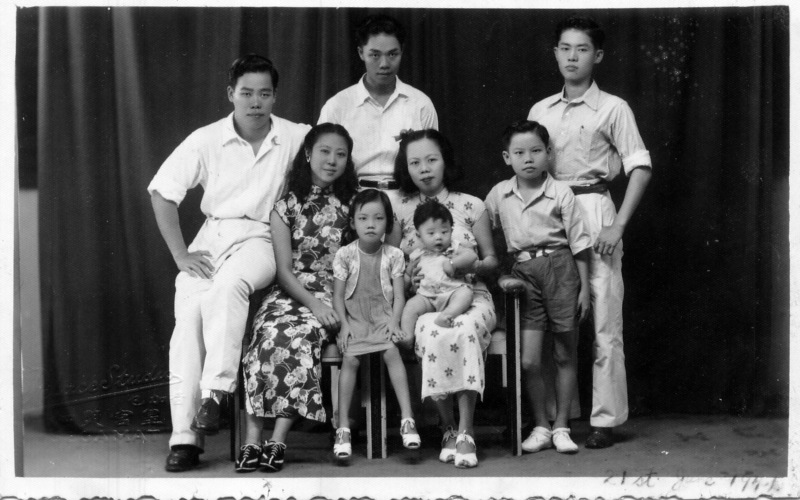 Derek contributed many of his photos to the PICAS collection at the National Archives of Singapore. You can read more of Derek’s sharp observations on his web site. What’s the connection between the movie “The Bridge on the River Kwai”, Changi Prison and 2 persons? Let’s start with the easiest explanation, the Oscar award movie starring William Holden and Alec Guinness. I saw the re-run of this action war movie when I turned 7 and never forgot the images of the blowing-up of the wooden bridge, Colonel Saito and the British POW contingent marching to the tune of “Colonel Bogey”. Together with many others (like The Alamo, The Battle of Gettysburg, Raid on Entebbe, to name a couple) with a historical theme behind them, I bought the laser versions at the HMV store in Hong Kong in the early 1990s. Why did I have to do it? The Singapore Censorship Board frowned on anything violent and my perception was they could not differentiate between a work of art, something history and street violence. So I was really worried that the airport customs would confiscate my prized purchases. 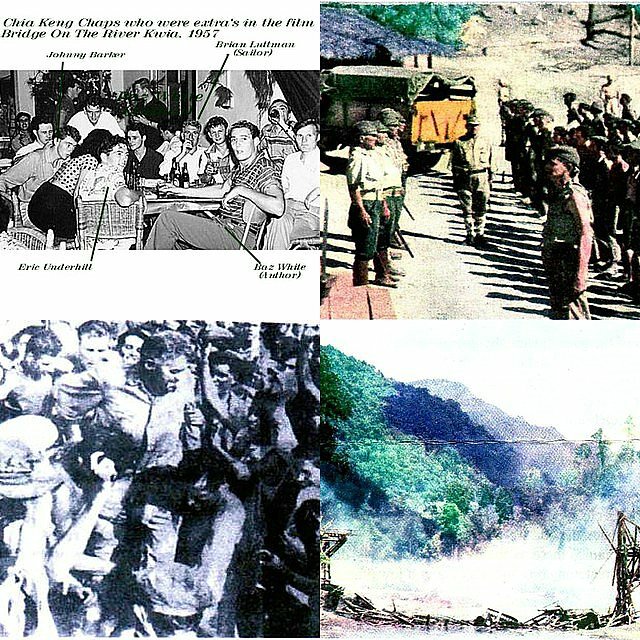 Did the movie really tell the whole truth about the Siam-Burma Railway construction during WWII? In fairness, we must go beyond the celluloid film. In June 1942 some 61,000 POWs from Britain, Australia, America, Canada, New Zealand and Holland as well as some 90,000 Malayans were put to work by the Japanese Imperial Army to construct a railway line 415 km long linking Kanchanaburi to the Japanese base camp in Thanbyuzayat in Burma. First estimates by experienced Japanese railway engineers suggested a time-frame of 5 years for completion but under tremendous pressure, the POWs were forced to complete in 12 months. The outcome was devastating even though it was an engineering feat. 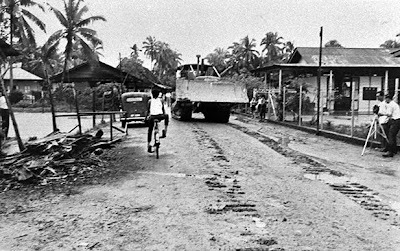 The British and Australian POWs were taken from Changi Prison and driven up-country over 4 days on the “cattle-train” from Tanjung Pagar Station. My cousin lost on his maternal side, “Uncle Robert Cheong”, from Kuala Lumpur who never came home after the war. What about the 2 persons mentioned? This refers to Derek and me. 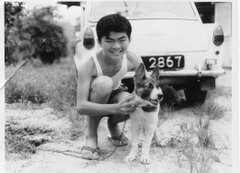 Derek was English who did national service at RAF Chia Keng in Singapore in 1957. It was through Derek that I was able to build up my photo collections on Singapore at a time when I was struggling to get old Singapore landmarks. I was a toddler when Derek was here. He confirmed what my eyes saw as I recollected my early childhood memories. Our friendship extended even to the golf course. He was a good single handicapper who enjoyed nothing but a walking course whereas I wished for a buggy course. Derek often encouraged me to visit the bridge on the River Kwai to seek out answers, something I never could quite catch what was on his mind. “Go not just for the sight-seeing”, he said. Derek shared with me stories about his RAF Chia Keng colleagues who acted in the movie of the same name. After they ROD in 1955, some of them headed to Ceylon where the movie outdoor production was made. When you watch the movie, there’s a scene of a group of defiant POWs who marched off to the tune of “Colonel Bogey” despite threats from Colonel Saito the railway camp commandant. That group of rank and file men were once NS enlistees from RAF Chia Keng in Singapore. During the outdoor shooting scene, the men were made to sing “Colonel Bogey” but their lack of singing talent made the film director David Leane switching over to whistling. That’s how the whistling part became the signature tune in the movie. 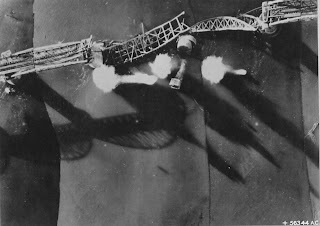 Photo 4: Two spans of the steel bridge receive a direct hit during a raid by the 20th Bomber Command’s 40th Bomber Group of B24s. Spending time in Kanchanaburi, I found the answers Derek might have wanted me to find out. The only sad part is I am unable to tell Derek. The wooden bridge was completed in February 1943 and the steel bridge in April 1943. Both the steel and wooden bridges were subjected to intense Allied bombing between December 1944 and June 1945. The wooden bridge was not blown up by Allied commandos as in the movie. On Jan 1, 1945 B24 aircrafts from the U.S. Air Force destroyed the wooden bridge and killing and injuring several POWs housed in the Tamarkan POW Camp 200 meters away. One span of the steel bridge was destroyed in mid-Feb 1945, another 2 spans destroyed between April and June 1945 which finally put an end to the railway link between Siam and Burma. Coming to Kanchanaburi also had its other rewards – I now have a better collection of Kanchanaburi WWII photos – and located many of the original sites. Incidentally the Singapore connection does not stop here. You get to see a little of Singapore’s heritage kept at the Kanchanaburi museums. This is a good site for another story about the River Kwai Bridge. Read also Brian Mitchell's post on the Cambridge Yasume Club. What do hungry teenagers do at a time when there were no fast food joints or instant noodles? Why, we cook our own not-so-instant noodles of course! Browsing through the supermarket shelves recently, I came across a product that had remained practically unchanged since the 1960’s …. this can of Ve-Tsin (msg). In Cantonese, we call it “mei cheng” (See photo 1). It reminded me of the time when my siblings and I used to cook our own dry noodles at home to fix our hunger pangs. The noodles we used came in rectangular slabs like those in Photo 2. What we did was to take a plate, add some light sauce and msg; plus some chilli sauce and oil and “chu yau char” – cubes of lard. We then boil some chye sim and cook the noodles. I am not sure what we used for meat; maybe some ‘bak chor’ or minced pork. Interestingly, the Ve-Tsin design looked exactly the same as it did before except for a difference in the lid. Can you spot the difference? In the old design, there is no lid or cover. To open the can, you needed to use a turn-key like the one in Photo 3 below. I seem to recall that the sardine cans of old too came with this type of design. Such design is quite rare today, and after much searching I found this can of luncheon meat. Wasted another $3+ because the meat tasted horrible. Likewise, had to discard my $1.90 can of Ve-Tsin after taking a few photos as MSG is practically banned in our home nowadays – my wife’s bias, not mine. I have set up a Facebook Fan Page for my book Good Morning Yesterday. I will collate and centralize all information and updates about my book there. Do drop by and share your views and suggestions - but remember to "Like" it first. Greatly appreciate if you would recommend it to your friends. This photo was taken during the ACS Great 60th Birthday Bash held at the SICC Grand Ball Room on the 10th of March 2012. My cohort of ACS old boys from 1968 as well as some old girls from 1970 held a combined 60th birthday gathering. Most of us would be 60 this year. I set up a station to promote and sell by book. To my pleasant surprise this gentleman who was attending a dinner function in the next room came over to purchase a copy. What a pleasant surprise. Here's the link to the Facebook Page. My beloved song book has traveled approximately 7,600 km with me in the late 70s, from Singapore to Melbourne, then to Sydney and back to Melbourne within a month. In the early years of my stay in Melbourne, it sat in my suitcase while I moved around a dozen places – from shared accommodation to pensioner boarding houses, rented flatettes and apartments, looking for work. I lived the life of a nomad, but my song book never complained. Once I had a room with a little bookshelf which could hold several books. My song book would share the bookshelf with my other books. 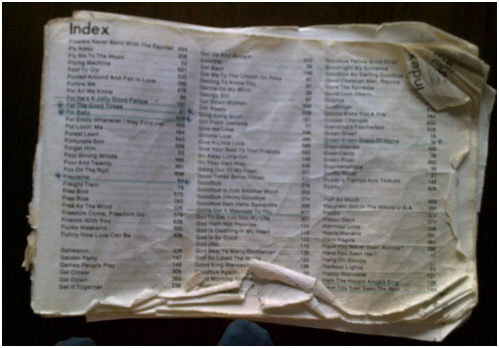 The song book was purchased in the late 60s, an era before the arrival of the CD, DVD and computer. 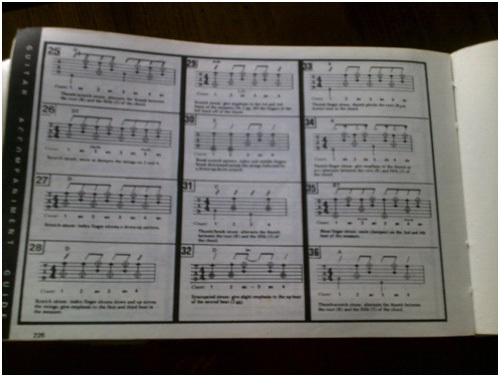 For most beginners on the guitar, song books like these were the only source where chords of songs could be found. My song book has over 650 pages, divided in several categories: folk, pop, yuletide and rock songs. 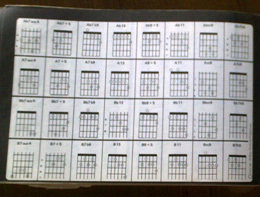 In the middle section, there are several pages of chord diagrams, for the guitar, ukulele and banjo as well. There are music sheets at the end of the book for the more advanced musician. As a beginner I relied completely on the chords which sat on the top of each line of the lyrics. Years later, I learnt that not all the chords were correct. However, I was not in a position to question the accuracy of the chords; if it didn’t sound right, I’d blame my strumming, or perhaps I was singing out of tune. One afternoon I was shopping in Chapel Street, South Yarra, with my friend Anne. I stood outside a music shop, looking through its glass window at the guitars on display. I pointed to Anne the guitar that I liked. Later she surprised me with the guitar while I was sitting on the chair of the hairdresser having a hair trim. That was the early 80s, five years after I left Singapore. Now that I had a guitar, my old song book once again became my regular companion during the many nights when I would serenade myself while imagining I was one of the Gibb brothers (Bee Gees) or the Everly Brothers. My song book was no longer tucked away in my suitcase. It now sat on my study desk, coffee table or sofa. It was a familiar and comforting sight, a constant reminder of the times I had first struggled with learning the guitar back home in Singapore. One night I was enjoying a few beers in my rented room of a boarding house, strumming the guitar with my old song book. Most of the residents in the makeshift rooms built at the back of the house were aged pensioners. As the night wore on, the more I drank the louder I sang and the more off-key my strumming became. It wasn’t long before Don, the ex-Korean War veteran from next door, popped his head into my room and asked if I was alright. He was probably concerned with my mental state as I was doing a Janis Joplin act, wailing on “Will the circle be unbroken”. Or was it “Me and Bobby McGee”? Yeah, we shared a few beers and a good laugh. That was in 1983. In recent years I discovered the internet – lyrics and chords of songs are now readily available and you can hear most songs on YouTube. My song book has since been relegated to the top shelf of my wardrobe. Each time I open the wardrobe door, it looks at me with forlorn eyes from its state of exile. Occasionally it’ll be taken out of the wardrobe when, in a nostalgic mood, I feel the need to look at all the old songs I used to play. My old song book will never be forgotten. It will always have its special place in my heart for being my faithful companion throughout the vicissitudes my early years in Melbourne. With the passage of time, my song book has aged, lost its front and back covers and several pages. 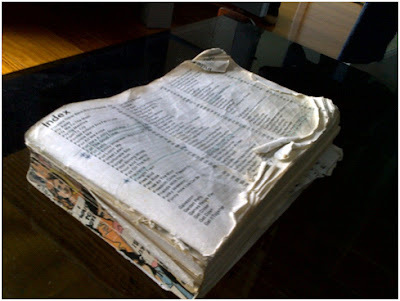 Many of its remaining pages have faded to a yellowish hue, fallen apart and dog-eared. Its physical deterioration makes it so much like us. Of all the things I’ve brought with me from Singapore, only two remain ... a brown suit case, and my beloved song book.